List of Passers for December 2014 Civil Engineer Board Exam Results - Balita Boss! The Professional Regulation Commission (PRC) released the December 2014 Civil Engineer Licensure Examination results. The official results were released on Thursday, December 11, 2014. The examination was conducted by the PRC on December 6 and 7, 2014 in cities of Manila, Baguio, Cagayan de Oro, Cebu, Davao, Iloilo and Lucena. Tacloban and Legapi Cities were cancelled due to Typhoon Ruby (Hagupit). Examinees in the said areas were advised for the announcement of PRC in the coming days. A total of 4,021 out of 8,127 examinees passed the December 2014 Civil Engineer Board Exam, according to PRC (via PRC Website). View or download the performance of schools in the December 2014 Civil Engineer Licensure Examination at prc.gov.ph. 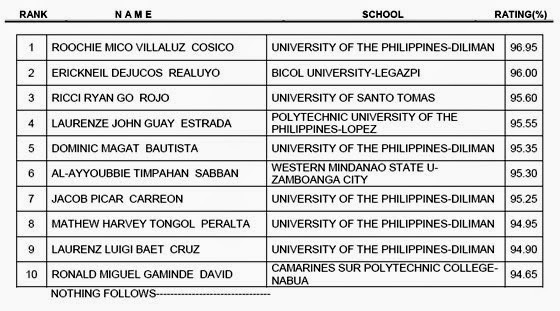 UNIVERSITY OF THE PHILIPPINES-DILIMAN graduate ROOCHIE MICO VILLALUZ COSICO topped the December 2014 Civil Engineer Board Exam with a passing rate of 96.95 percent. The Board of Civil Engineering who administered the December 2014 Civil Engineer Board Exam were Engr. Apollo S. Enriquez as Chairman, with member Engr. Praxedes P. Bernardo. Registration for the issuance of Professional Identification Card (ID) and Certificate of Registration will start on December 15, 2014. The date and venue for the oathtaking ceremony of the new successful examinees in the December 2014 Civil Engineer Licensure Examination will be announced later, the PRC said. Civil Engineer board exam covers the following subjects: mathematics, surveying and transportation engineering (35%); hydraulics and geotechnical engineering (30%) and structural engineering and construction (35%). In May 2014 Licensure Exam, a total of 1,862 out of 4,289 successfully passed the Civil Engineer Board Exam. Harvey A. Malolos of Mapua Institute Technology-Manila topped the May 2014 exam with a score of 95.10 percent.